Home » Municipality » Building contraventions » Nkandla – At What Cost? Traditions come and go, and it seems once again to be a growing trend to have extended family living together in one home. But the numbers have grown out of hand at Zumaville, with the President’s brothers, many wives, and who knows who else living in the outrageously expensive “compound”. 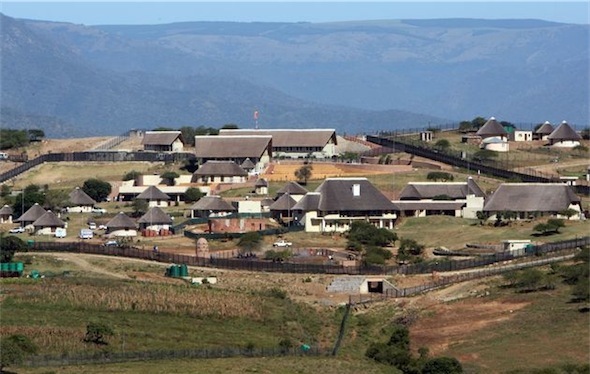 It is difficult to estimate the total square meterage of buildings built at Jacob Zuma’s Nkandla property up until the middle of November, that are spread over rural rolling hills and valleys. Even given the number of dwellings, there are so many of them – some double storey and some with basements – only plans would reveal an accurate total floor area, and it is unlikely that he would have had to submit plans to any official, public body, local authority or tribal chieftan. Now, if you look at the image above that is available for download from www.grafika24.com you will get some very interesting insight into to costs, and visually, into just how immense the development is. If you take just the costs from Nº 1 (R1.3 million) and Nº2 (R48 million) plus Nº8 (R66 million), you will get a total of R115.3 million. This does not include Nº3 which states that R3 million was paid for bullet resistant glass alone. I am sure that there are many more millions of Rands over and above this that have been spent that we hope will come to light in due course. The average (conservative) building cost per square meter for a middle class house in 2013 is R4 000. Taking the costs shown on the Grafika illustration into account, this would mean that the total house floor area that should have been built at Inkandla would be 28 825 square meters. Also, an average three bedroom suburban house is around 200 (maybe 250) square meters. 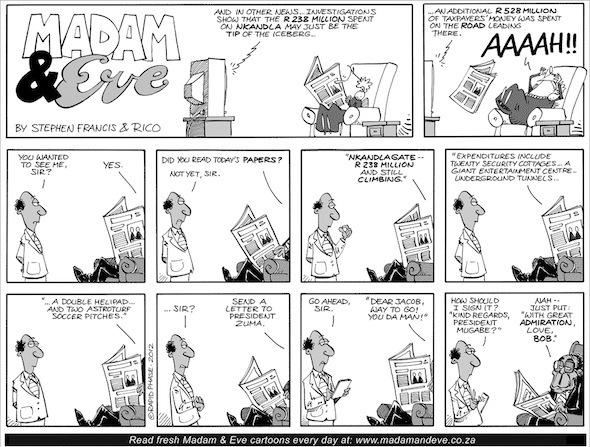 It then stands to reason that there should be about 145 middle class houses built at Inkandla. 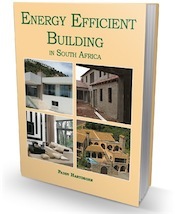 Of course there aren’t that many dwellings – and we know that they are well beyond the attainability of Mr and Mrs Average Middle Class South African – black, white, brown or pink. An Average RDP house is around 50 square meters and is built for around an average cost of R1 500 per square meter. So if we do the maths, then the total house floor area for RDP houses that could have been built at Inkandla, would be 76 866 square meters. If you take the maths further, and divide 76 866 by 50, you will realize that 1 537 RDP houses could have been built instead of one “compound” for an extraordinary (in the strangest sense of the word) extended family that just happens, at this point in time, to be the “First Family” in this country. With media reports claiming that building costs have so far amounted to more than R210 million, together with “consulting fees” of R49.1 million (City Press 12th March 2013), plus the road upgrade of R582 million, this amounts (to date) to R841.1 million! The number of RDP houses that could be built with that amount of money, using the same formula as above would be 11 215! There is something very WRONG! The question though is what and who is going to do something about it? Right now it looks like nothing and no-one! If an average South African build a 250m2 wrongly or many countless times, how then do those South Africans expect a busy scheduled President to understand the so called security features of his homestead? Let’s get this straight and once: “No president in the world is responsible for his security. Neither is President Zuma.” The security of a president is the prerogative of the Defence Department’s Specification and is implemented by the National Department of Works. I don’t remember President Zuma being employed in any of those departments; notwithstanding the wasteful expenditure incurred by the tax payers on that project. I appreciate the frustration of all South Africans in this matter, myself included, but looking for answers from the president will not assist with the solution. I think the two departments must explain clearly as to what actually happened. I hear what you are saying but why are there so many unanswered questions? I AM A SOUTH AFRICAN CONCERNED WITH THE WAY AND THE MANNERS IN WHICH OUR SOUTH AFRICAN STATE PRESIDENT IS INVOLVED IN A NUMBER OF SCENARIOS THAT LEAVE THE CITIZENS CONCERNED,BUT WITH NO ANSWERS TO THEIR CONCERNES AND QUESTIONS. 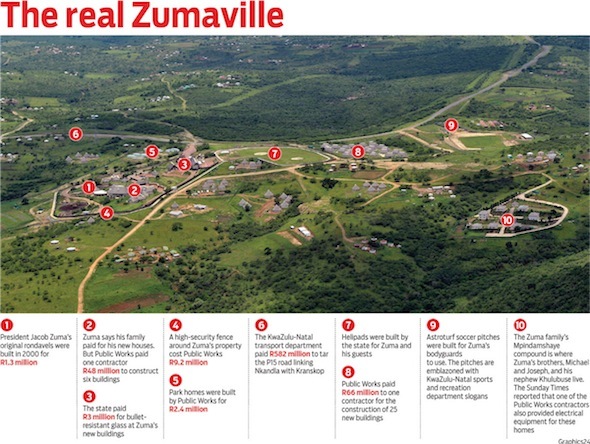 THE NKANDLA SCANDAL DESRVES MANY QUESTIONS TO BE ANSWERED,RANGING FROM,THE COSTS OF BUILDING NKANDLA,THE CONSULTANTS,AND THOSE OTHER CONSULTANTS INVOLVED IN THE CONSTRUCTION AND RENNOVATION OF THE NKANDLA RESIDENCE OF JACOB ZUMA. PLEASE PROVIDE A DETAILED REPORT ON THE ISSUES I HAVE MENTIONED.